Hennessy came out with their water collection and tarp tensioning system years ago as a simple but innovative way to collect water run-off from a tarp. The funnel cup clips onto the a mitten hook on the corner tie-out of Hennessy-brand tarp and has a threaded end that matches to most narrow-mouth water bottles. Not only can the system collect water, it acts as an automatic tensioning system, taking out the slack and pulling the tarp taut during the storm. The Hennessy water collection and tarp tensioning system combines a funnel, attachment point, filter screen, and screw top to make a clever water collecting system. It’s simple, innovative, and brilliant. Inside the cup you’ll find a chevron-style clip that is used to connect to the tarp. Under the clip is the cone-shaped filter. The filter is a screen that can be popped out. The screw top fits most small-mouthed water bottles. You can see the clip and filter in the cup. I also store the bottle lid in the cup so it won’t get lost. I’ve been testing and using the Hennessy water collection system for years now. It’s a simple system that works amazingly well. In fact, the first time I really started testing it I was skeptical because an empty bottle, once attached, tends to turn the funnel up and it appears that it won’t work as well. Within a few minutes of even light rain, the water begins collecting and once their is enough weight, it levels the bottle and pulls it down. As the bottle fills and pulls downward, the second effect comes into play: tarp tensioning. This is a great side-benefit of the cup and helps with stretchy tarps like silnylon. Now let’s get to the gritty details. 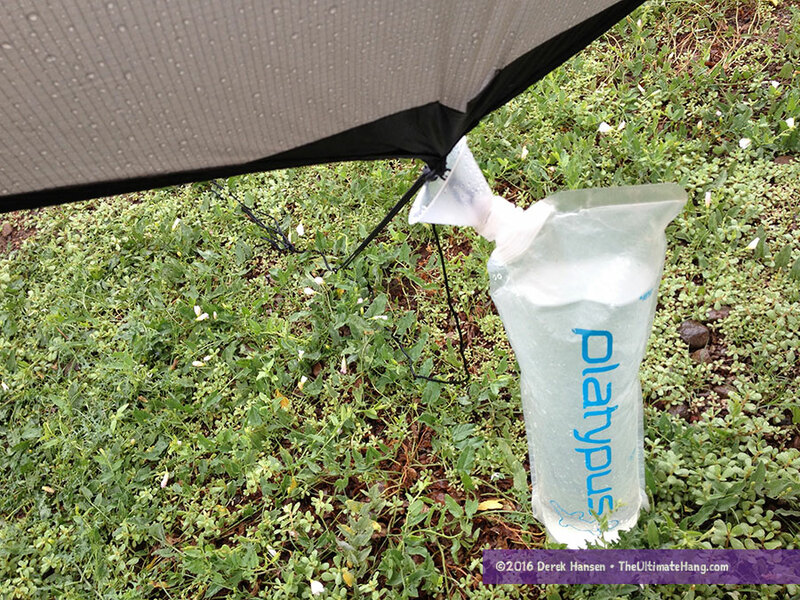 On one hand, collecting rain water off your tarp means easy “free” water that doesn’t need to be treated. 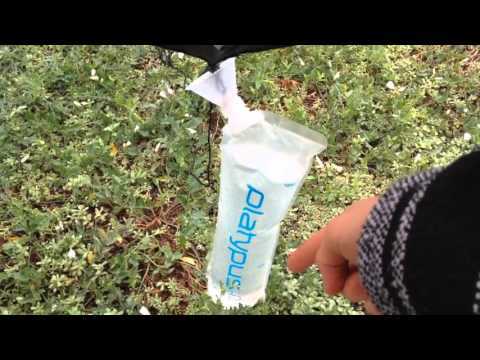 It can save some time in collecting water for the next day without much effort. On the other hand, any debris on the tarp can pollute the water. The most damaging, bird poop, can have severe health risks. The challenge, therefor, is to keep your tarp clean. Personally, I’ve only had birds poop on my tarp when I’ve had it up in the same spot for a few consecutive days. In the field, I’ve never had an issue with a bird roosting and pooping on any tarp. However, it is still something to be aware of. If you find bird poop on your tarp, wash it thoroughly. Organics, like leaf litter, pine needles, commonly fall on a tarp but do not pose a health risk. The screen in the collector will block out the large items. Sometimes dust and dirt gets blown on and can collect on a tarp. You can always use the rain to your advantage, waiting a minute or two for the rain to wash off any dust and then attach the collector and water bottle. The other catch is that for locations where rain comes often enough that a nightly shower is expected, water is often plentiful and more easily obtained. I’m thinking specifically of a hike along the Appalachian Trail, rain forests (including the Pacific Northwest), etc. In northern AZ, the monsoons are frequently an afternoon event, but we often get evening showers. But, again, based on the trip, it may not be of much value. For backpacking and camping, water is an essential daily resource that can’t be left to the whim of a rainstorm. So, in a nutshell, yes the collectors work and they have a “cool gadget” factor, but unless you’re starring on a reality TV show and surviving on rainwater collection, they do have limited practical use if you’re on the move. It’s really makes more sense if you’re camping in a place for a few days (maybe) and have the reliability of consistent rain showers, or maybe in an emergency situation. To make it easier to clip/unclip the collector from the tarp, consider cutting the mitten hook so it remains open. Personally, I haven’t had problems using the stock mitten clips (uncut) because I push the funnel clip against the end of the mitten hook and it pops off easily. I store the water bottle lid inside the funnel so I don’t lose it. The tarp and tie-outs help prevent the lid from popping out. 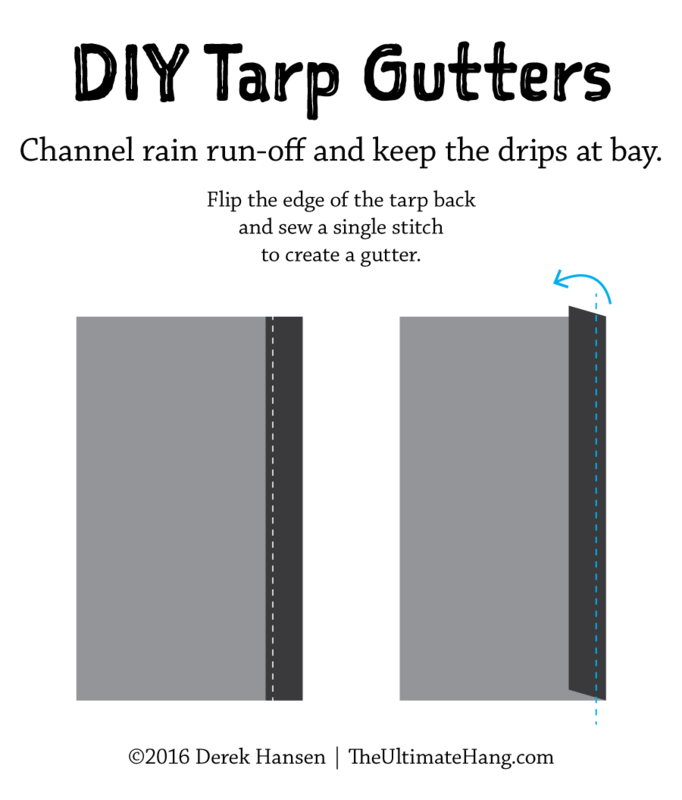 To channel more water directly to the funnel, consider “pinch-sewing” the edges of your tarp to create your own tarp gutters. Keep your tarp clean! Inspect for debris or bird poop and wash it thoroughly before using the collector. 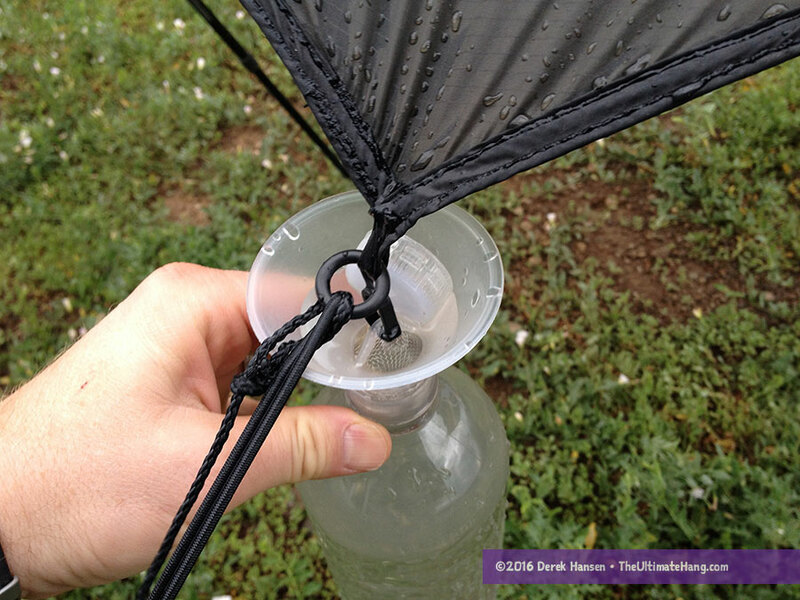 Kammok Dragonfly Tarp comes with a water tensioning and collection system that is integrated with the tarp. I’ve looked at these since I bought my first HH back in 2008, but never pulled the trigger as I could not see a situation where they would be worthwhile. The one type of hike where I thought they might be worth carrying is a coastal trail, like the Oregon Coast Trail, where you are hiking along the ocean. There would be plenty of dew and rain to fill the water collector, but not much fresh water around as salt water cannot be purified through normal means. Here in southern AZ I can’t see much use — it’s just too dry and rain is too infrequent. There might be a few times during the monsoon season where it would work, but then the rain comes late in the afternoon while I’m still hiking and don’t have my hammock set up yet! Excellent observations. I should amend my review to indicate how I best envision using these, because they do have limited use just based on tarp deployment. The other catch is that for locations where rain comes often enough that a nightly shower is expected, water is often plentiful and more easily obtained. I’m thinking specifically of a hike along the Appalachian Trail, rain forests (including the Pacific Northwest), etc. So, in a nutshell, yes the collectors work and they have a “cool gadget” factor, but unless you’re starring on a reality TV show and surviving on rainwater collection, they do have limited practical use if you’re on the move. It’s really makes more sense if you’re camping in a place for a few days (maybe) and have the reliability of consistent rain showers. Thanks for doing the review. I thought these were pure genius and picked some up but haven’t tried them out yet. Isn’t there a drip filter on the market (Sawyer mini) that will attach to the funnel and the water bottle. Or is this (bird poop) out of the realm of the filter’s purpose? I’d have to check to see if the filter would screen out those things. I was thinking of using the larger sawyer bags that I have to. Screw on to the funnel and then filter it after but I like your idea with just screwing the filter to it ..good idea ! I was thinking of collecting water on 2 or 4 points ..but would only need the one mini filter to filter it all .. but I’m looking at more of a survival situation more than for a overnight stay .. just another crazy prepper..lol. But I like the idea of those collectors..caught my interest.